Ah, yes, the peacock - the epitome of male beauty in the animal kingdom. I think that creation and/or evolution went all out for the male of this pheasant species. You'd be hard-pressed to find a more pretentiously elegant bird. 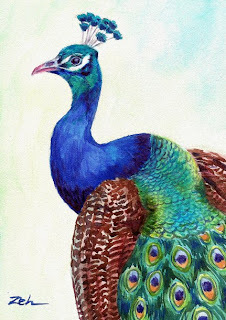 I'd been thinking of painting a peacock, and then when a cousin emailed some pictures she'd taken on a trip to the zoo, I just couldn't resist. The zoo is where you'll find the blue peacock in the US. They are natives of India and Sri Lanka. Males are called peacocks while the females are referred to as peahens, both being peafowl. The outrageous display of feathers on the male is used to attract females during the mating season. If a male has a gorgeous enough set, he can end up with a nice harem for himself!